Support modes: Miracast / DLNA /Airplay. Airplay: Support IOS 6.1 above. Miracast: Support Android 4.4 or higher. Entertainment: online movies/ videos/ audio/ TV/ webcast/ web browsing. Mirror smart phones, tablets, laptops, PC(Photo/video/music/Word Excel PPT PDF/ online TV/internet) to your big HDMI HDTV (up to 1080P). 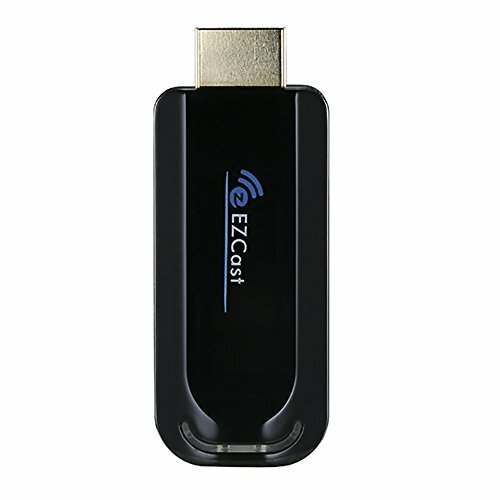 1080P high resolution,2.4G Wireless Miracast / DLAN TV dongle makes it easy to mirror your phone to the monitor/HDTV/projector with HDMI port. The Miracast / DLAN Airplay (press one button to switch) HDMI TV Dongle supports both iPhone Airplay & Android .Max compatibilty for Android 4.2.2, IOS 6.1 above. It can be upgraded online and works well while Andriod, IOS systems are upgraded. Linux Operating System, easy to set, running fast & stable. Just simple 3 steps to setup wireless connection of the iphone/android to TV, monitor or projector. Attention: 1. The dongle must be powered by external power adapter(at least 5V/1A ). 2. Not Compatible with Netflix,HBO go, HULU and Honda motor. 3. Please check whether your Android smart device supports MiraCast(if not, it not works).4.Contact our service team if in need. It is important.